November, recognized as Military Family Appreciation Month, is the perfect time for students to begin working on illustrations for the school division’s annual Art of the Military Child art contest. Open to all Virginia Beach City Public Schools (VBCPS) students, the contest features artwork related to being a military child. Stradling’s work features a U.S. Navy deep sea diver to represent the work of her father. “I want to be a deep sea diver too, because I want to follow my father’s path. I’ve always loved swimming,” she said. Jonathan Calhoun’s dad is also the inspiration for his Art of the Military Child entry. 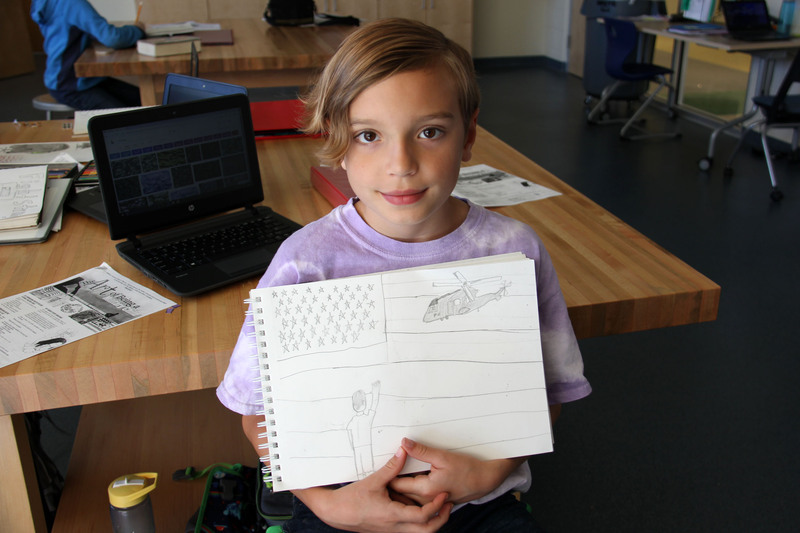 The Bayside Elementary third-grader explained, “He’s just become a Chief Petty Officer so I have the United States Navy symbol that he wears on his hat and on his pin, and his division, the Greyhawks.” The eagle in the background is there “to represent America, not just the USN,” he added. Calhoun and Stradling are among the students from schools citywide in Leigh Drake’s gifted visual arts class at Old Donation School. It’s an art project that Drake incorporates in her lessons every year. The connection is not restricted to military dependents. “A lot of students have dealt with the heartache of losing friends who have moved or they know what their friends are going through,” said Drake. Kevin Dison, a third-grader at Christopher Farms Elementary, is illustrating a scene from his friend Jeremiah’s life. Likewise, Kempsville Meadows Elementary fifth-grader Jayden Yoon remembers being nearby when his friend called his mom who was deployed overseas to Japan. Military deployments are a common theme for art contest submissions, like the completed piece Drake shared which featured a handwritten message in the corner. “Some parents come home at night but mine is too far to do that. 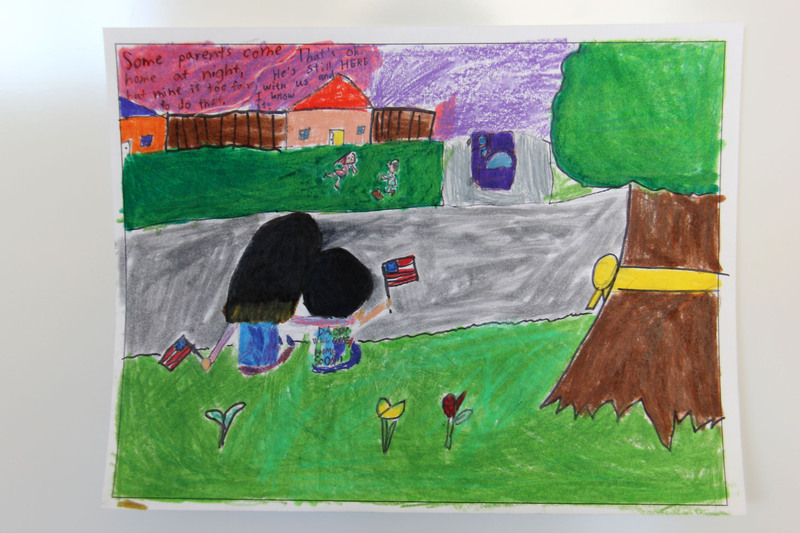 That’s OK. He’s still here with us and I know it,” wrote Kaitlin Salazar-Mesina, Pembroke Elementary third-grader, in her artwork featuring people holding American flags and sitting near a tree with a yellow-ribbon tied around the trunk. 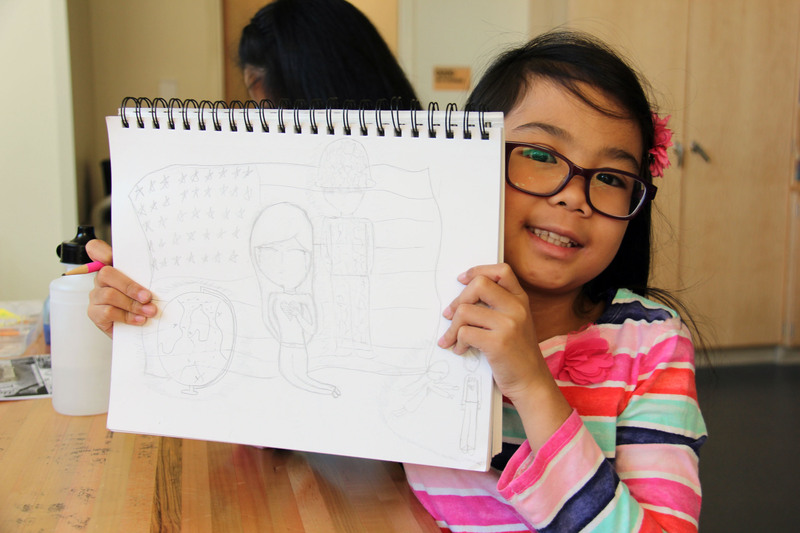 Holland Elementary third-grader Eunice Manlangit also thinks of her father often when he is at sea as a chef for the U.S. Merchant Marines. “My drawing is about a girl crying because her dad is in the military and he is away. I added these lines to make it seem like she’s thinking, like memories. There is a picture of her dad, of her and her dad, and this is a picture of all the places her dad has gone,” she said pointing to the globe marked with X’s. 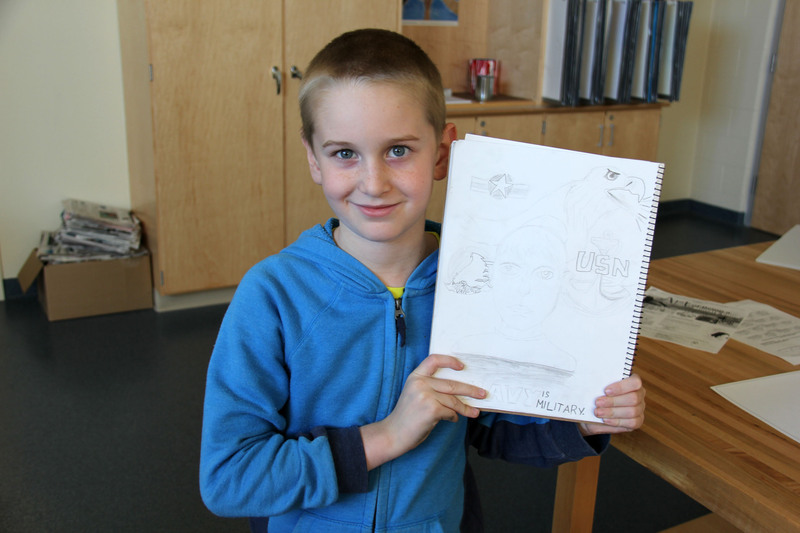 Each year, Drake is struck by the emotions the art project evokes in students. Entries to the Art of the Military Child art contest are reviewed by judges, and winning artwork and other select pieces are displayed at Lynnhaven Mall throughout the month of April in recognition of The Month of the Military Child. 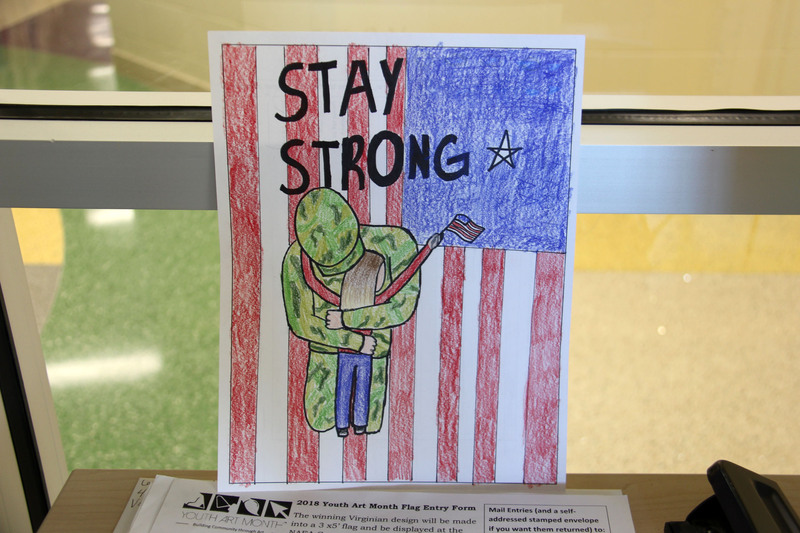 Entries may also be selected for submission to the Military Child Education Coalition, a national organization that features student artwork in their publications and on their website. The public art exhibit in the spring is an aspect of the contest Stradling likes because of what it conveys to military servicemembers. The deadline to submit Art of the Military Child entries is Tuesday, Dec. 19. The official entry form, with contact information for questions, is available online, and students also may ask their art teachers for related paperwork. 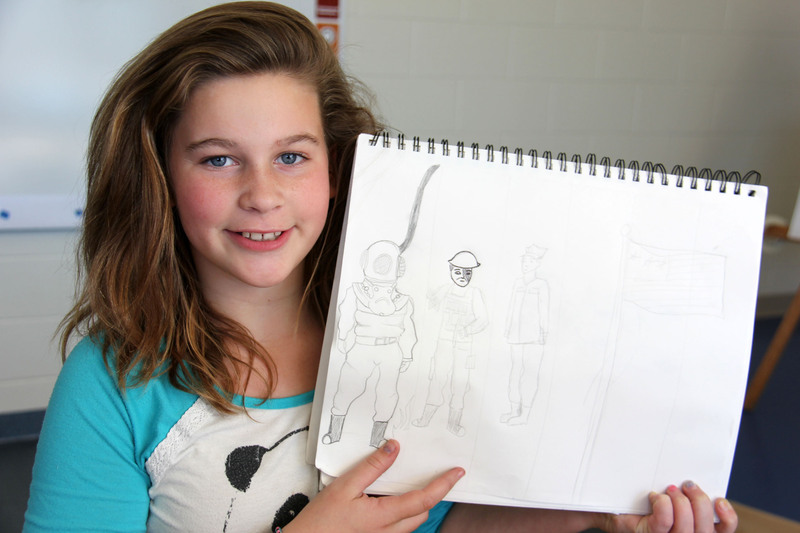 To view photos from last year’s Art of the Military Child exhibit, visit the VBSchools Facebook page.